Someone suggested to me the other day that some of my designs were very much in the ‘Liberty Style’ and that i should look at trying to go to one of their ‘open call’ events. I have been researching this, watched the YouTube video (below) was quite excited as saw some wonderful designs, felt a little intimidated by some, but then motivated by others…and totally inspired over all. I was a little put off at the fact that they were queuing from 5am!! – i don’t think i could hold down a conversation at that time in the morning to be honest, and also i only saw one ‘oldey’ such as myself that was on the video – but i must not try to let that put me off hey? Better late than never! I am now thinking that i may want to continue to develop the design aspect through my MA..the only thing that puts me off is that the university that i am in has no textiles or fashion dept, and doesnt have ONE member of staff to ask for help, so i have been flying solo on this unfortunately, but maybe thats a good thing in the end? 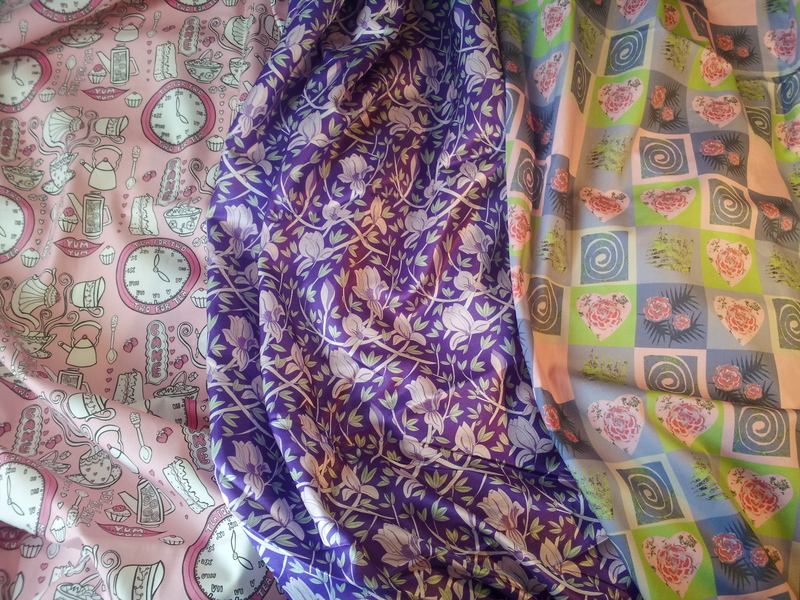 The fabrics that i am displaying arrived today from USA, the size of the print has changed, and i have spent all morning trying to work out why, and realised that when i sent them off the first time they were on the wrong colour setting and so they have printed them out on their default setting of 150dpi even though they were saved at 300dpi – however – i actually think it has worked out better as i think the Time for Teas is better larger as you can see the design more, and the squares and the magnolia are better smaller – so it’s all ok in the end!